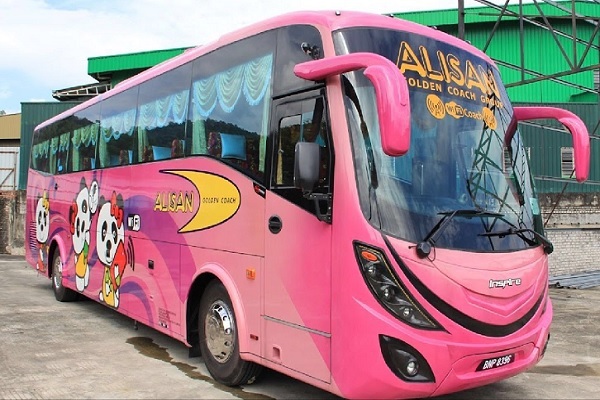 Alisan Golden Coach Express provides long distance express bus service between Malaysia and Thailand. We have 26 seater single deck, high deck, 37 seater double deck and many other types of coach. Our coaches are designed by professionals to give provides comfort seating to our customer. Some of our coaches come with power plug and FREE WIFI. We provide comfortable coach, good service and affordable price to our customers! Currently we only have counters in Kepong (Desa Complex) and Hat Yai (near to Lee Garden). However, you can also purchase our tickets over the counters at Terminal Bersepadu Selatan (TBS). We operate daily routes from KL to Danok, Hat Yai, Bukit Kayu Hitam and Changloon which all with return trips available and many more. Check out Alisan Golden Coach bus schedule and Alisan Golden Coach bus image to learn more about us.